Next month in Bangkok 7 WBC Muay Thai Championships will be on the line. Fighters from all over the world will be competing at this Mega Event including the Light Heavyweight World Title Fight between Artem Levin & Simon Marcus. Artem Levin became the WBC World Champion when he defeated Kaoklai Kaennorsing by decision last year. Since Levin became the WBC World Champion he has continued down the war path defeating eight straight opponents in 2011 alone, defended it recently against Frenchman Cheick Sidibe on February 28th, 2012 in Russia. Simon Marcus recently defeated Joe Schilling in their rematch at “Lion Fight Muay Thai VI” by decision in a WBC Light Heavyweight interim title fight. Marcus captured the interim title title from Schilling, and now has his eyes set on the WBC World Title. 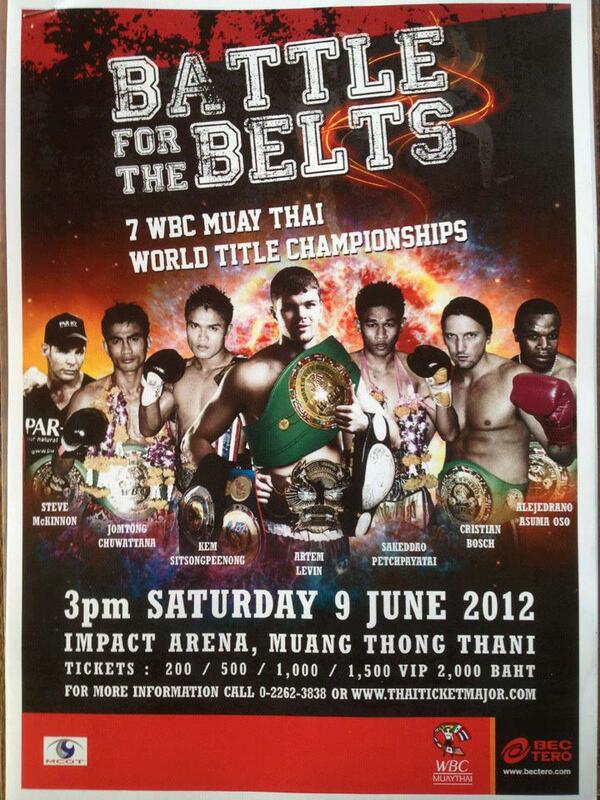 Other fighters scheduled to appear are Thai Boxing extraordinaire Kem Sitsongpeenong. Kem is an absolute wrecking machine coming off a 1sr Round TKO victory at Thai Fight 2012. He made the doctor earn his money that night cracking Mickael Cornubet’s dome open with a vicious elbow assault. Cornubet was clearly out matched in the fight. This event will be live on Television in Thailand on Channel 9. Hopefully soon we will be providing a link to the stream of the fight. Here is a list of the bouts for the evening. Kem Sitsongpeenong of Thailand VS Alejedrano Asumu for the super-welterweight belt. Australian Steven McKinnon VS Frank Munoz of the Netherlands for the super-cruiserweight belt.